Many couples will need to adjust their retirement plans because of two big changes affecting Social Security benefits. Because of Congress’ November, 2015 budget deal, two popular claiming strategies are coming to an end. The “file and suspend” and the “restricted application” options are being eliminated. 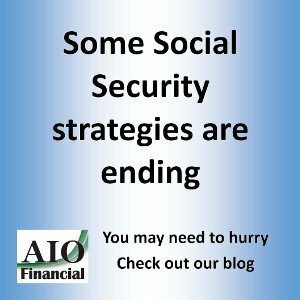 Choosing one of these strategies to maximize Social Security benefits in the next six months (May 1, 2016), could add hundreds of thousands of dollars to a married couple over their lifetimes. You need to do some careful retirement planning, quickly. Changes to the “file and suspend” strategy will take effect in six months, so you still have time to take advantage of this claiming method if you meet certain age requirements. Under the current rules, once you reach your full retirement age, you are able to file for your Social Security benefits, but request that such benefit not actually be paid. You received delayed credits, which increase your own Social Security benefit by 8 percent per year, plus any cost-of-living adjustments that may also be added. By using the file-and-suspend strategy, you can allow your spouse the ability to claim a benefit based on your benefit, while at the same time allowing your own benefit to continue to grow. After May 1, instead of family members being allowed to receive a benefit based on your earnings record after you’ve merely filed, the law makes it necessary for you to actually be receiving benefits for them to do so. What you can do: If you are at your full retirement age or older, you can “file and suspend” your Social Security benefits by May 1 and still have a spouse or child collect benefits based on your earnings record, while your own benefit is suspended. But the elimination of the “file and suspend” strategy in the new budget deal means younger workers will not have that option. If they suspend their benefits at their full retirement age, they can still earn delayed retirement credits, but no one can collect benefits on their earnings record during the suspension. Another popular strategy for couples is to file what is known as a “restricted application” once you reach your full retirement age. By filing a restricted application, you are essentially telling Social Security ‘pay me only my spousal Social Security benefit, not my own retirement benefit. By utilizing this approach, you can receive at least some Social Security benefits, while still allowing your own retirement benefit to earn delayed credits until as late as age 70. At that time, you could switch over to your own, higher benefit. What you can do: If you will be age 62 or older by the end of this year, you can still use the “restricted application” strategy. If you are younger than 62 at the end of 2015, you will no longer be able to just collect spousal benefits at full retirement age or later while letting your own benefit grow. So here’s what you should do: Explore both strategies. Talk to a qualified financial professional who can look at how Social Security fits into your overall retirement plan and help you maximize your benefits. If you are already properly utilizing either strategy, you will be grandfathered, butit is critical for married taxpayers who qualify to take advantage of the brief remaining window to take advantage of these strategies.